"Until I began to build and launch rockets, I didn't know my home town was at war with itself over its children, and that my parents were locked in a kind of bloodless combat over how my brother and I would live our lives. I didn't know that if a girl broke your heart, another girl, virtuous at least in spirit, could mend it on the same night. And I didn't know that the enthalpy decrease in a converging passage could be transformed into jet kinetic energy if a divergent passage was added. The other boys discovered their own truths when we built our rockets, but those were mine." So begins Homer "Sonny" Hickam Jr.'s extraordinary memoir of life in Coalwood, West Virginia-a hard-scrabble little company town where the only things that mattered were coal mining and high school football. 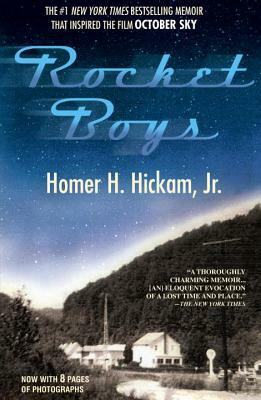 But in 1957, after the Soviet satellite Sputnik shot across the Appalachian sky, Sonny and his teenaged friends decided to do their bit for the U.S. space race by building their own rockets—and Coalwood, Sonny and A powerful story of growing up and of getting out, of a mother's love and a father's fears, Homer Hickam's memoir Rocket Boys proves, like Angela's Ashes and Russell Baker's Growing Up before it, that the right storyteller and the right story can touch readers' hearts and enchant their souls. In a town where the only things that mattered were coal-mining and high-school football, where the future was regarded with more fear than hope, a young man watched the Soviet satellite Sputnik race across the West Virginia sky—and soon found his future in the stars. In 1957, Homer H. "Sonny" Hickam, Jr., and a handful of his friends were inspired to start designing and launching the home-made rockets that would change their lives and their town forever. Looking back after a distinguished NASA career, Hickam shares the story of his youth, taking readers into the life of the little mining town of Coalwood and the boys who would come to embody its dreams. Step by step, with the help (and occasional hindrance) of a collection of unforgettable characters, the boys learn not only how to turn scrap into sophisticated rockets that fly miles into the sky, but how to sustain their dreams as they dared to imagine a life beyond its borders in a town that the postwar boom was passing by. Rocket Boys has already caught the eye of Hollywood: The producer of Field of Dreams is now working to produce a major motion picture in time for next year's Academy Awards. A uniquely endearing story with universal themes of class, family, coming of age, and the thrill of discovery, Homer Hickam's Rocket Boys is evocative, vivid storytelling at its most magical.